Celebrate America in Wichita this Fourth of July with large, public fireworks displays and special events at Visit Wichita partners. You can even shoot off your own fireworks in Wichita as long as you follow the regulations and safety tips set out by the City of Wichita and Wichita Fire Department. The Wichita Parks Foundation hosts Red, White & BOOM! presented by Freddy’s Frozen Custard & Steakburgers again this year! Join the party 6-10:30 p.m. Tuesday, July 4, on the lawn of the Hyatt Regency Hotel in downtown Wichita. Food trucks park along Water Street at 6 p.m., and a beer garden will be open all evening. The concert begins at 7:30 p.m., and the fireworks hit the sky starting at 9:45 p.m. If you want to see fireworks in Wichita this Fourth of July, Red, White & BOOM! is a can’t-miss event. Enjoy BBQ, baseball and those same fireworks with the Wichita Wingnuts! The usual Friday night fireworks move up to Tuesday, July 4, for the Independence Day game against the Winnipeg Goldeneyes. The game starts at 6:05 p.m. and the fireworks light the sky over Lawrence-Dumont Stadium just after the game! Happening a few days before the Fourth of July, the Bradley Fair Summer Concert Series presents its Celebrate America Concert with fireworks and jazz artist Vincent Ingala 7:30-10 p.m. Thursday, June 29. 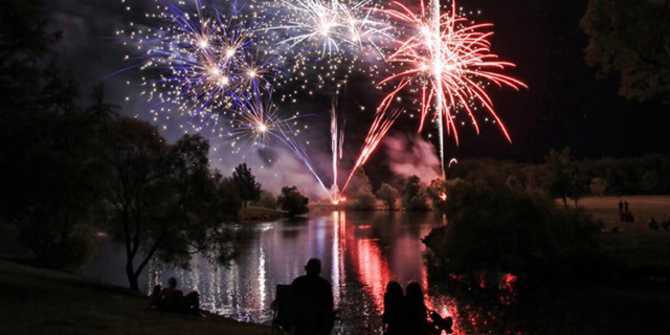 Come early so you can get the best seat in the house – next to the stage with the perfect view of the lake for fireworks! Cowtown invites you to celebrate America’s freedom by exercising your right to bear muscles in a tug of war contest. You’ll eat pie until you split your sides and watch baseball until the sun goes down! From 10 a.m. to 5 p.m. Saturday, July 1, you can Celebrate America for regular admission at Old Cowtown Museum. Games, ice cream and a beer garden are also available during the festivities. In all unincorporated areas of Sedgwick County, Kansas, Class C consumer fireworks may be possessed and shot July 1-4. Fireworks known as “bottle rockets,” or any other firework mounted on a stick or wire, are not Class C consumer fireworks and are illegal in the State of Kansas. Specifically, in the City of Wichita, Class C consumer fireworks can be possessed and shot from 6 a.m. June 27 to midnight July 5. Fireworks are not allowed to emit a shower of sparks more than six feet in any direction and cannot be labeled as emitting flaming balls. All fireworks shot in the City of Wichita must be purchased within city limits, which means fireworks from outside of the city cannot be brought into the city to shoot. Watch for the City of Wichita’s approved list of fireworks in the Wichita Eagle. The Wichita Fire Department also requests all individuals who shoot off fireworks in the city have a water source nearby and ready to douse any impromptu flames. Remnants of fireworks should also be doused before being thrown away. Have a festive and safe Fourth of July in Wichita!